Do you use your smart phone in your car for Navigation, listening to Audio Books or music, or just to make and receive calls? I do. For the longest time I just placed the phone on my center console. 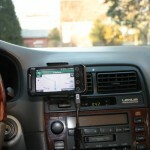 While I drove I would pick my HTC Evo Shift 4G up in my hands to use it. I would do this while trying to keep my focus on the road. I would also be looking around for any Police cars. In New York state, and nine other states (see current list of states here), it is illegal to hold a phone in your hand when you are driving. What I needed was a car mount that would hold my Android high enough so I could view the screen without having to lower my eyes significantly from the road. However, it was hard to make the decision on which one to get. From pictures on the Web it is difficult to determine if the phone’s volume buttons would be blocked by the mount. The side USB connector being blocked was also a concern. I wouldn’t want to use my GPS and not be able to plug in the USB power connector. 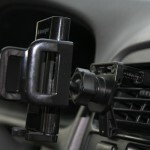 Additionally, the mount should give the option for either wind shield or vent mounting. The wind shield mounting arm should be long enough to avoid having to reach far to touch the phone’s screen. It should also allow rotation of at least 90 degrees. 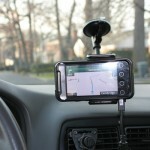 I found the car mount that provides all the features described above. 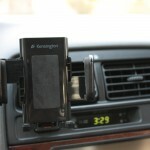 It is the Kensington Universal Wind shield/Vent Car Mount. I’ve been using this mount for more that three months now. It does a great job as a car mount. 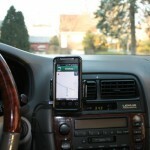 It is sturdy and keeps the phone in place while driving. The arm is long and solid but still easy to re-position when needed. The suction is strong and has no problem holding up my Sprint HTC Evo Shift in its Otterbox case. Yes, my phone is hefty. 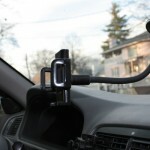 When I was looking for mounts I could not find enough pictures of car mounts in action. 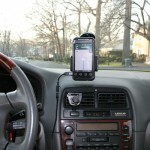 So, I posted a few pictures showing the Kensington mount in use in my car.